« Superhero Movie Themes: Collateral damage is people! After I read these I wonder, “Could this have been prevented?” Sure, through proper handling, storage and transportation, but also through not having a gun. 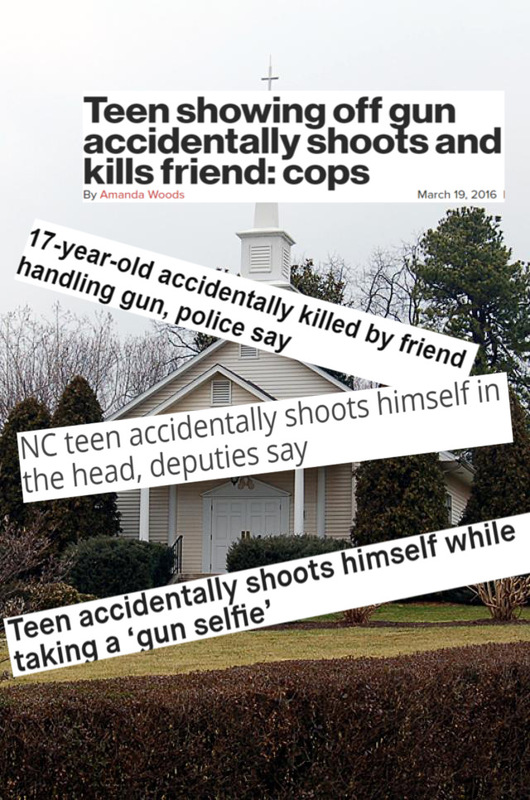 No gun = no gun accident. QED. However, sometimes your gun-owning neighbor, his 3-year-old or a gun-carrying student has an accident with a gun, and hits others. Some of these incidents are classified as an accident, others as criminal negligence. How many people who had an “accident” while cleaning their gun were actually suicides? If they can prove suicide, insurance won’t pay. It depends on the circumstances and how it is classified by the police. This distinction is important because when innocent people are injured or killed by accident, it’s treated differently by the law–and by insurance companies– than when the injury or death happens because of negligence, intent or a criminal act. I wondered, when a student at Liberty injures someone with a gun by accident, who is liable? Let’s say a student who lives on campus has a gun accident and injures others. If he is a minor, his parent will be liable for damages in a civil case– and so will the school. The injured people will sue both the student’s parents and the school. In some cases they will settle with an insurance company in others it will go to trail and a court will determined the percent liability each has and determine compensation. I was going to get all technical about the Liberty’s duties to their licensees and invitees vs. trespassers as defined in the book Premises Security: A Guide for Security Professionals and Attorneys, William F. Blake, CPP, CFE and Walter F. Bradley, Esq. But insurance legalese is the most boring of all the major legalese, it’s designed so you don’t read the fine print –until you are sued, or want to make a claim and find out you aren’t covered. Here’s the thing: this area of law and insurance is built on legal precedence and historical data, not wishful thinking and anecdotal stories from different situations. University officials are welcome to teach students to prepare to stop the “bad guy with a gun.” They are free to make some security decisions based on what they think will work to protect their employees, students and guests. But, if they are wrong, there will be a huge price to pay, in the death and suffering of the students, staff and guests–and also financially. By not adhering to the norms for security in the industry–and going against the advice of law-enforcement–when there is a gun incident, the University will bear greater liability. Maybe Liberty’s insurance carriers will stand by them, but in a recent lawsuit Citizens Insurance Co. of America and Hanover Insurance said they had no duty to defend them. The Liberty people won’t listen to me. But they will listen to the underwriters and donors, the people who have to pay for the errors in judgement made by Liberty’s administrators. They might also listen to the parents of any innocents injured, especially if they can’t be shut up with a cash settlement. Money and pissed-off parents can lead to policy changes. The Liberty administration has fixated on an incorrect understanding of how the world works and tied their policy to it–and they won’t let go. Instead, when confronted with evidence contrary to their beliefs they will “double down,” hoping to be proved right. They will point to any mass shooting and say, ‘If OUR students were there with their guns, they would have stopped it!” It’s almost like they are hoping for an incident on their campus so they can be proved right. News-wise a single gun accident with one injured can’t compete with three injured in a shooting in one day. Multiple student gun accidents on campuses spread out over many months are ignored. Plus, criminal acts are more dramatic. If nobody is tracking the trends on individual shootings, they blend into the noise. The people whose opinions seem to matter most–the money people–need to be made aware of the failure of this “more guns keeps you safer” security policy. The other problem is that the public doesn’t always hear about any non-crime gun incidents. We know public universities cover things up, private ones can explain away things easier. I’ve been focusing on accidents and I know they can be downplayed as “only a tiny percent of overall gun injuries and deaths”. The push back on this will focus on the times guns are used for self defense. But, the kind of self defense they believe happens with more guns and more accessible guns, isn’t happening, what is happening is that unintentional gun deaths increase. What does the actuarial data show? I said earlier that insurance legalese is boring, sometimes facts can be boring. It’s easier to wrap stories around dramatic events and to build policies on them. But people can build policies on data too. And the data in this case tells a different story. What we know is that unintentional gun deaths, when there are more guns and they’re more accessible, unintentional gun deaths will increase. What we know is that alcohol and guns are a terrible combination. And that’s incredibly relevant in a college environment. Yes, in a college context, where the majority of sexual assaults involve people who know one another. Just try to imagine, you’re in somebody’s dorm room, you’re in someone’s apartment, now they’re armed because they’ve been convinced that they should have a gun to protect themselves. If that gun is there, actuarially, that person is at greater risk of dying from that gun than they are of any other event happening. Stop trying to politicize gun accidents Spocko! Do I really care about the health and safety of the students and staff at Liberty, or do I just want to use a hypothetical tragic accident in the future to make a point? First, yes I do care about their safety. It’s terrible when innocent people are injured or killed with a gun. Second, I’m trying to use tens of THOUSANDS of actual tragic accidents to make a point. Historically and statistically if there are guns, there are going to be unintentional gun injuries and deaths in the years to come. The schools can continue to push the idea that it makes a lot of sense to have a gun for protection — despite all of the evidence to the contrary. But their insurance carriers have the obligation to look at the historic realities of guns on campus. The carriers’ job is to figure out the risks of guns on campus, and then decide if they want to take it on. If they think it is too risky, they can do what EMC did in Kansas and decide not to cover schools that arm teachers. But there are other alternatives: raising premiums, changing liability laws, hiding settlements, change what is covered, get the US government to assume the risk. Several of these are being used now. To be fair, Liberty might be able to pull it off. They have a self-selected demographic with shared values. Their students, facility and staff might become the best trained, most disciplined group of gun carriers in history! Everyone might score 100% perfect scores on ever safety test! It could happen! Maybe on their campus guns will never be used by anyone to solve conflicts between people. Perhaps their students with mental illness won’t be tempted to use them. Contrary to previous evidence, drinking and guns on their campus will mix as smoothly Kenny G and Michal Bolton. While students and teachers with itchy-trigger fingers are waiting to save the day, let’s keep looking at the data and keep informing the money people every time there is a gun accident that could have happened at Liberty U. Maybe the only times guns will be used will be when their “good guys and girls with guns” successfully identify– and then kill–bad guys with guns. Maybe nobody else will be accidently injured in that process. This scenario seems like a long shot to me, I guess i just don’t have their faith.